Molecular chemist James Tour is a bit of an expert at building tiny vehicles. For the last decade, he's been building nanocars - single-molecule cars that have four wheels, axles and suspension and can 'drive' across a surface. 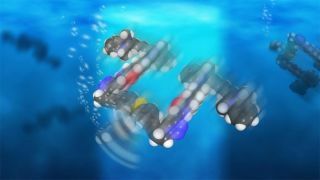 His newest creation, however, goes below the waves instead - it's a single-molecule nanosubmarine, powered by ultraviolet light. Its body consists of 244 atoms, carefully arranged in a 20-step chemical process. When the submarine is exposed to light, the connection holding the propeller to the body alternates between double- and single-bond states, allowing it to turn. Every full rotation drives it forward 18 nanometres. While that doesn't sound like a lot, it operates at more than a million rpm, giving it a top speed of a little under an inch a second. "These are the fastest-moving molecules ever seen in solution," Tour said. Unfortunately, it can't steer yet. But the subs prove that the molecular motors can push through solutions of moving molecules - no easy task. "This is akin to a person walking across a basketball court with 1,000 people throwing basketballs at him," said Tour. Eventually, it's hoped that the submarines could carry cargoes for medical and other purposes. Victor García-López, who worked on the submarines with Tour and authored a paper describing the breakthrough in Nano Letters, said: "This is the first step, and we've proven the concept. Now we need to explore opportunities and potential applications."